John Landis’ INNOCENT BLOOD – A Not So Guilty Pleasure! Once again John Landis has proven why he is the master of mixing horror with comedy. He did it first in 1981 with AN AMERICAN WEREWOLF IN LONDON and he was back at it eleven years later with INNOCENT BLOOD. Things that worked in his werewolf film…things like a recognizable cast, amazing effects, fun cameos and just the right mixture of horror and comedy…work just as well when he takes on vampires. Why he isn’t making more films I will never know. The very beautiful Anne Parillaud plays Marie, a vampire who lives by a code, only feeding on criminals. Taking advantage of a local mob war she decides that Italian is the way to go, making her victims look like mob hits. 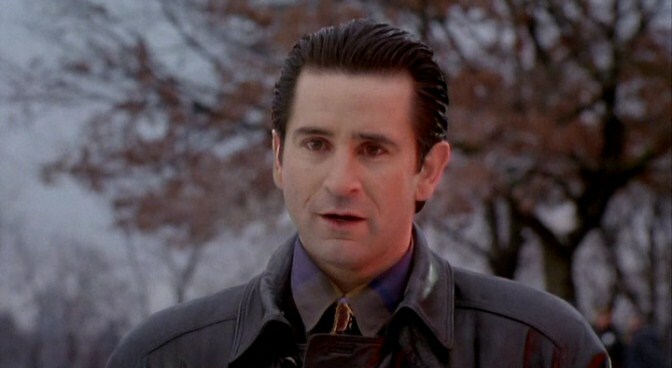 Anthony LaPaglia plays Joe Gennaro, an undercover cop infiltrating the mob who becomes involved with Marie. Mob brutality is shown early on as Sal Macelli, played by Robert Loggia, shows what happens when one of his guys crosses him. Eventually Gennaro is made when one of Marie’s Italian victims is found, with his head blown off by a shotgun. Now Joe has to keep a low profile so that he doesn’t get killed by the mob. Marie then makes the mistake of not killing her next victim, who turns out to be Sal, who then becomes a vampire himself. From there craziness ensues as Sal slowly makes his family into vampires and Joe and Marie must team up to defeat them. Every actor who has ever played a mob character either on tv or in movies is here. The movie is also full of great co-stars and cameos, including Don Rickles, Angela Bassett, Luis Guzman, Tom Savini, Frank Oz, scream queen Linnea Quigley, Forest J. Ackerman, Sam Raimi and Dario Argento. It is people like this that really add to the fun of these movies as you never know who is going to show up next! The effects in this film are amazing. The first time you see Marie with her glowing red eyes is a shock to the system and is a great addition to the look of the vampires. 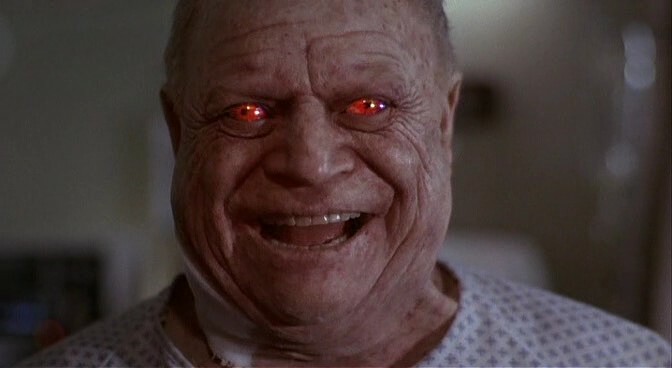 Another great effect is when Don Rickles, who plays Sal’s lawyer Manny, is hit with sunlight after being turned into a vampire himself. His body’s destruction is one of the best ever put to film and has yet to be topped in any vampire film. 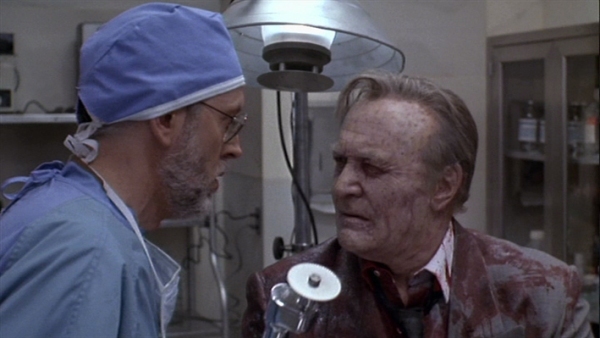 The prosthetic work is top-notch and there is no shortage of blood in this film. It is so nice to see this all done with practical effects, like reflective lenses in the eyes to simulate the glowing, as all of this today would be done in a computer. This movie is filled with all other kinds of tributes as well; from Frank Sinatra music to scenes from classic horror and monster movies. Whenever a tv is playing a classic film is being watched. Films like THE BEAST FROM 20,000 FATHOMS (1953), Hammer’s HORROR OF DRACULA (1958) , DRACULA (1931) and PHANTOM OF THE RUE MORGUE (1954) are shown. This film does take minor liberties when it comes to vampire lore. The biggest example is that Marie is seen quite often looking at herself in the mirror. This ability though is important as in one scene, after “killing” Sal, she looks at herself in the mirror with her face covered in his blood and she has a look of shame and disgust for what she is. This is probably why she tries to redeem herself by only eating bad people. This film is in desperate need of a Blu-ray release. It is only available on DVD in the standard format which you can order HERE! Supposedly this movie was also released on DVD in an unrated version with more blood in Germany but I have not been able to verify this. I can only hope that a re-mastered release is in the future! This movie is definitely one of my all time top 10 vampire films. Check it out! This entry was posted in Big 80's Horror!, DVD/Blu-Ray Review, Misc Mayhem and tagged 000 Fathoms, AN AMERICAN WEREWOLF IN LONDON, Angela Bassett, Anne Parillaud, Anthony LaPaglia, Beast From 20, Dario Argento, Don Rickles, Dracula, Forest J. Ackerman, Frank Oz, Horror of Dracula, Innocent Blood, John Landis, Linnea Quigley, Luis Guzman, Mafia, Mob, Mobsters, Phantom Of The Rue Morgue, Robert Loggia, Sam Raimi, Tom Savini, vampire, vampires. Bookmark the permalink. ← 2013 MASK-FEST: Wicked Witches and Cthulhu Chaos!